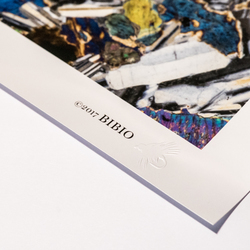 Bibio - ‘Gabbro’ Print. Bibio. ‘Gabbro’. Limited edition of 10 prints. Lightjet (digital C-Type) print on high quality Kodak Metallic paper. This paper has a glossy surface and a metallic look, making vivid colours shine in different lights and viewing angles. The photograph is of a microscope slide, taken with a specialist macro lens using cross polarised light. The subject material on the slide is colourless to the naked eye, the colours are revealed when light passes through two sets of polarising filters. 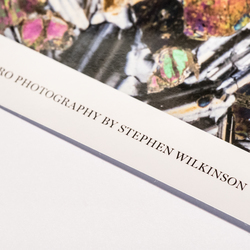 Image size is approximately 38cm x 38cm, embossed with the ‘Bibio’ fly logo. The print is unframed and will be shipped in a cardboard tube.